Lawyers involved in international commercial transactions know well that unforeseen events affecting the performance of a party often arise. Not surprisingly, exemptions for non-performance are dealt with in a significant number of arbitral awards. 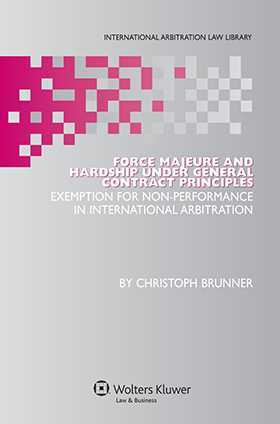 This very useful book thoroughly analyzes contemporary approaches, particularly as manifested in case law, to the scope and content of the principles of exemption for non-performance which are commonly referred to as ‘force majeure’ and ‘hardship.’ The author shows that the ‘general principles of law’ approach addresses this concern most effectively. Generally accepted and understood by the business world at large, this approach encompasses principles of international commercial contracts derived from a variety of legal systems. Its most important ‘restatements’ are found in the 1980 United Nations Convention on Contracts for the International Sale of Goods (CISG) and the UNIDROIT Principles of International Commercial Contracts (UPICC). The book is a major contribution to the development of the use of general principles of law in international commercial arbitration. It may be used as a comprehensive commentary on the force majeure and hardship provisions of the UPICC, as well as on Art. 79 of the CISG. In addition, as an insightful investigation into the fundamental question of the limits of the principle of sanctity of contracts, this book is sure to capture the attention of business lawyers and interested academics everywhere. Chapter 1. Introduction. § 1. Force Majeure and Hardship in International Commercial Transactions. § 2. General Principles of Commercial Contracts: Methodological Approach. Chapter 2. Scope of Application of General Contract Principles. § 3. General Remarks on the Governing Law and the Application of General Contract Principles. § 4. Choice of Law Agreement Providing for the Application of a National Law. § 5. No Choice of Law Made by the Parties. Chapter 3. The Concept of Non-performance. § 6. The Concept of Non-Performance under General Contract Principles. Chapter 4. Force Majeure Excuse.§ 7.The Force Majeure Excuse as a General Principle of Law. § 8. Individual Requirements of the Force Majeure Excuse under General Contract Principles. § 9. Legal Effects of the Force Majeure Excuse. § 10. Interpretation and Effects of Force Majeure Clauses. Chapter 5. Hardship (Change of Circumstances): Fundamental Change of the Equilibrium of the Contract. § 11. Hardship as a General Principle of Law. § 12. Individual Requirements of the Hardship Defence. § 13. Legal Effects of Hardship. § 14. Interpretation and Legal Effects of Hardship Clauses. § 15. Hardship Distinguished from Other Remedies. Chapter 6. Conclusion.